La Trobe University in partnership with Japan’s NEC Corporation and Kyoto University, has developed communication robots with ‘emotional intelligence’ that are aimed at improving organisation sustainability, human well-being and health. This breakthrough has been pioneered at La Trobe University’s Research Centre for Computers, Communication and Social Innovations (RECCSI), directed by Dr Rajiv Khosla. RECCSI is a collaborative network of excellence and one of the two robots, Matilda will be featured on ABC TV’s ‘New Inventors’ program on Wednesday 16 March. ‘Just like when people meet for the first time, Matilda have a period of getting to know individuals’ responses which are then used to detect feeling and emotion for future encounters,’ says Dr Khosla. On Wednesday’s show Matilda, with Dr Khosla’s help, will conduct her first job interview with host James O’Loughlin to determine whether he is emotionally fit and culturally compatible for a sales position within a company ‘Cockatoo’. The robots are able to ‘read’ and respond to human emotion, such as facial cues, voice and touch. Matilda and Jack have been created with the aim of eventually being deployed in the health sector reducing stress levels of both carers and their patients and to enhance public health services and improve other needs within society. Dr Khosla’s philosophy on ‘humanised technology’ is focused on making science more useful and meaningful within the community. ‘Technology is a tool which can help us behave more creatively. Inanimate technology only serves a purpose of convenience while these emotionally intelligent robots will enhance people’s lives’ he says. Matilda has already been set to work in a Queensland aged care facility to help assess distress and anxiety levels in patients. She was able to communicate information electronically to the nurse’s station which alerted them to attend to patients urgently. The robots have the capability to help school students as well as they are also designed to lend a hand with homework. Their other functions include being a companion to tired drivers, which could help in reducing road fatalities. 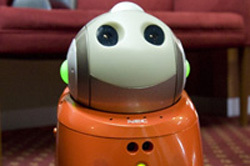 The robots can also assist in non-verbal communications for children with autism. The future of this technology may see the robot’s able to identify medical alert tags and detect physical irregularities, like heart attacks or strokes. Dr Khosla believes robots like Matilda and Jack will greatly assist in alerting healthcare professionals in situations where a patient may have become indisposed and unable to call for help. ‘RECCSI along with its partners is now looking at new lines of research to better meet the social and care needs of the aged. Elderly care is a sector that is growing fast and we have to think of new and creative solutions to help,’ says Dr Khosla.